One of the greatest joys of summer in New York City is boating on the East River with the Manhattan skyline as your backdrop. Every year, from May until August, Brooklyn Bridge Park offers free (Yes, free!) kayaking—just head to the boathouse between Piers 1 and 2 for a 20-minute session of paddling bliss. All the equipment is provided, there are single and double kayaks—some doubles have room for a small child to sit in the middle—lifejackets are mandatory and you should know you’ll probably get a little wet, so wear swim clothes or something that dries quickly. Stretching 1.3 miles along the East River, this beautiful revamped waterfront is proof that an a paradisiac slice of nature can exist right in the city. Pier 2 is tricked out with recreation facilities for basketball, handball, bocce, shuffleboard and roller-skating (open daily 6am–11pm). Rent your bikes at Pier 1's entrace for a spin on the Greenway, then stop at Pier 6 to explore a playground featuring wonderfully landscaped play spaces, including the Water Lab—a stone-strewn area with water underfoot to splash in—plus, New York's largest sandbox. At Pier 3, post up with a blanket and book, or take a peaceful stroll minus traffic noise thanks to Sound Attenuating Hill. Continue walking south and you'll come across the Pop-Up Pool and one of the prettiest walks in NYC, the Brooklyn Heights Promenade. 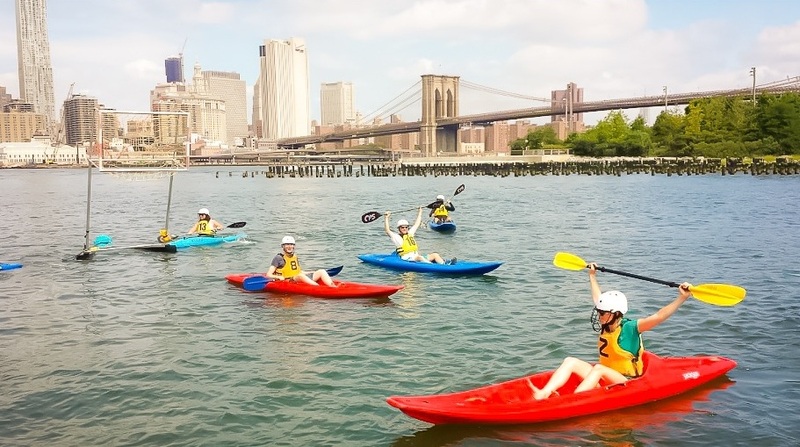 Add clean bathrooms, a food court, spots for fishing and the mutli-purpose sports fields at Pier 5 and there’s not much room for improvement—especially when views of downtown Manhattan and New York Harbor are the backdrop.